Home Auto Insurance Auto Insurance Coverage Do Married Couples Get Lower Car Insurance Premiums? How Can Married Couples Find Cheaper Car Insurance? You know that you could see tax savings when you’re married, but did you know you may pay less for car insurance too? Your policy savings may not pay for the catering bill from your wedding, but it’s definitely worth comparing insurance quotes. Find out what the average cost of auto insurance savings are for married couples and see if you can find cheaper coverage for you and your spouse. Here’s how to do it. Will Getting Married Lower Your Insurance Premiums? From an insurance company’s perspective, married people are safer, more responsible drivers. Therefore, they’re less of a risk to insure. It seems strange that putting a ring on it will magically make you a safer, more responsible driver, but it’s true. According to a study in 2015, a 20-year old woman pays 22 percent less for car insurance, on average, if she’s married. A 20-year-old man pays 20 percent less if he’s married. To further investigate, we went ahead and pulled data from around 300,000 drivers in the U.S. that completed a quote in 2018 through Compare.com. Through this research, we discovered that the average annual car insurance premium for a married individual was $1,468 and the average annual premium for a single driver was $1,529. Looks like married couples are still saving money on auto insurance. Here’s another reason to compare car insurance as a newly married couple. If you’ve been with the same auto insurance company for a long time, they may nudge up your premiums. “Customers who’ve been with the same insurance company for 11 years or longer have had so many gradual rate increases that they save an average of $426 on their premiums when they finally do switch,” USA Today reports. Yikes. That’s why it pays to compare insurance quotes. Review your coverage limits: If your policy matches the state minimum requirements, you may want to raise the limits to protect your new family’s financial future. Even if you and your spouse consider yourselves fairly safe drivers, springing for uninsured motorist coverage can help make sure you and your spouse are covered if someone else hits you without having proper coverage. Put Both Cars On One Policy: Many insurers offer a multi-car discount for households with more than one vehicle. Get quotes from multiple carriers: Use compare.com to compare multiple auto insurance rates. You’re more likely to find the best rate if you compare companies. What If Your Spouse Has a Bad Driving Record? That’s a tough conversation. Just like bad credit, debt, or a messy relationship history, if your partner has several traffic violations or a DUI, car insurance can become more expensive after you’re married. Nevertheless, it will still probably be cheaper to insure both you and your spouse under one policy. All drivers in a household can access all cars, so most insurance companies will require notification of licensed drivers in the household. Some insurance companies will opt for a named-driver exclusion if your spouse has a particularly bad driving record. A named-driver exclusion specifies that your spouse isn’t covered or permitted to drive your car. Not all insurers are willing to do a named-driver exclusion, so be careful if you want to go down this route. Here’s the good news: You’re married! You can now work together to improve your spouse’s driving record. Taking a driver education class can help insure that your spouse’s last accident will remain his or her last, eventually lowering your rates. Another option is to have your spouse as the primary driver for the oldest, cheapest car in the household. Remember that you’re together for the long haul and eventually the points will eventually drop off your spouse’s record. Aside from saving money by getting a joint car insurance policy, there are many other ways to put a little extra cash in your pockets. Here are some quick tips to do just that. 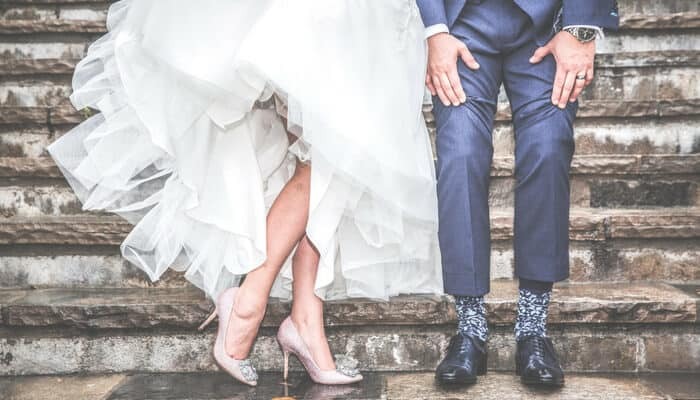 The single most important financial decision you can make as a newlywed couple is to establish a budget, then stick to it. For many, anxiety builds around the thought of a budget – assuming it removes any financial flexibility and spontaneity – the reality is that a budget gives you a framework for understanding your financial situation in real-time. The best thing about a budget is it reduces conflict amongst young, newly married couples. By understanding where the money is going, you know exactly how much you can and cannot afford. One of the quickest ways to save money is by doing what millennials call “cutting the cord.” This is the term for unsubscribing from cable television and instead using an online streaming service to watch movies and shows. The average cable bill comes in somewhere around $100 per month (or $1,200 a year). And while that $100 provides you with lots of channels and options, most people only watch a handful of these channels. As a result, you’re simply throwing money down the drain. What would you do with $1,200 extra dollars? Coupons can help you save some serious cash. Thanks to many websites that aggregate coupons and deals, you can easily search for a discount any time you buy a product online. Furthermore, by signing up for a membership program at your local supermarket, you can save money on things like groceries and household items. Small savings make big savings! How much do you spend on a gym membership each month? According to national data, the average membership costs between $40 and $50 per month. You’re looking at as much as $800 per year when you include annual fees and other add-ons. Do you get $800 worth out of your gym membership each year? The good news is that you don’t need an expensive gym membership to exercise and stay fit. You can work out at home, run around your neighborhood, or join a cheap gym with basic equipment. If you’re smart about this aspect of your spending, you can save a few hundred dollars per year. Ready to save money? Get your free online car insurance quote comparison! It’s easy and takes just minutes on Compare.com.